International Retail Real Estate Expert, founder and CEO of Lizan Retail Advisors (LRA) an International consulting firm specialized in the Global Retail industry and malls. LRA advises Retailers on their expansion international strategies, through the Market Strategy, Franchise Development, Market Planning, Site Selection and Representation Services. He has extensive experience in the shopping center industry and has helped retail companies to develop their business internationally for more than 20 years. Prior to founding LRA, Jorge served as Vice President of Business Development of the International Shopping Center Council (ICSC) from 2006 to January 2014, where he was responsible for the development and implementation of the programs initiatives of the association worldwide. He was responsible for the development of internationally ICSC, especially in Latin America, India and other emerging markets and his work has been the key to the success of ICSC in the new markets. He created some of the most successful ICSC conferences, such as RECON Latin America and the Caribbean Conference and is co-founder of the Initiative “Hispanic markets of the ICSC in the USA”. Jorge was also the Director of “World Shopping Centers Summit Program” in 2012 that took place in City of Shanghai, China. Before joining the ICSC, Jorge held the position of Real Estate Manager for the Caribbean and Latin America for “Yum! Campaign, where his responsibility was the expansion of the brands of the company KFC, Pizza Hut and Taco Bell in the region. Jorge also worked for Carrefour, as National Gallery Manager Commercial in Mexico, in whose function was responsible for development, marketing and operation of a portfolio of more than 20 shopping centers. At the beginning of his career, He also worked as a Design Projects Manager and Building. He is also a regular contributor in different magazines with articles about industry issues. 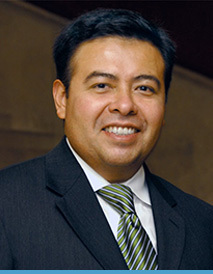 He graduated in Architecture from the Universidad Iberoamericana (UIA) in Mexico City and has an MBA from Thunderbird, School of Global Management in Glendale, Arizona and he also is a member of the Thunderbird Global Council (TGC). Jorge actually lives in New York City and has being an avid traveler, he has visited more than 80 countries around the world.